On the Sunday afternoon of PAX East 2017, we had the opportunity to get some helpful advice from Nick Smith about succeeding in this industry. Afterwards, we met up with him at the PAX Australia Roadshow, which was showcasing lovely indie-games from Australia. Among the hundreds of intriguing indie-titles spread out across the show-floor, EarthWork Games‘ Forts, a game that Nick is the artist for, was a standout. It wasn’t until I started writing this article that I realized I had a deeper history with this Worms-esque style of game than I had remembered. Some of my earliest gaming memories — aside from stomping on Goombas and saving Hyrule– were actually spent on my dad’s MS-DOS computer. Gorillas was one of the games I played, a turn-based game where you angled shots trying to nail your opponent while the sun in the sky reacts to your throws– the game was bananas (I’m sorry). Anyways, my point being that this genre of game has been around for quite some time, but Forts feels fresh and there’s some reasons why. 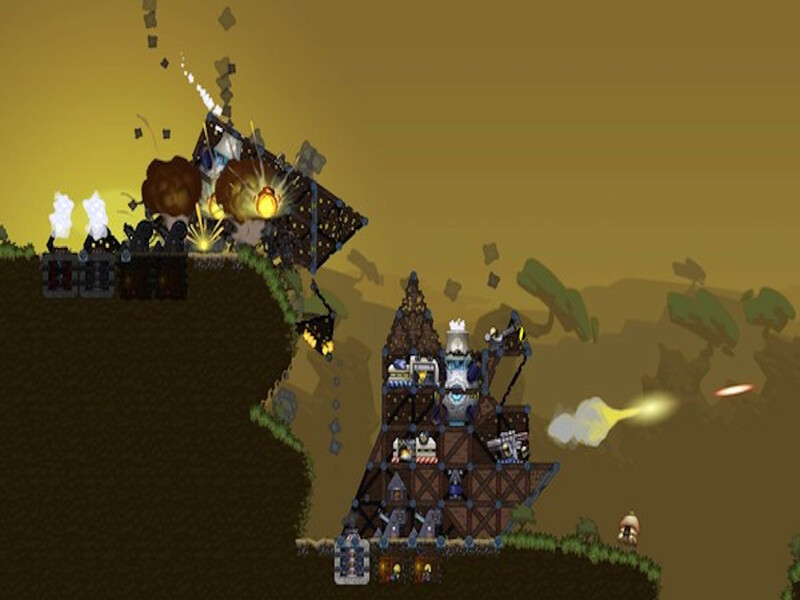 Forts is a physics based, action-RTS that really differentiates itself because it takes place in real-time– no build phase, no attack phase, no mercy. You spend your time trying to allocate the right resources to building up your base and creating your army, all while your enemy is doing the same. Though not a groundbreaking concept, but in an RTS where your enemy begins in range of your attacks from the get-go it adds a dash of haste and suspense to planning out your building and attacking. Sense of urgency plays a vital role into formulating your strategy. On top of being a fort-based, real-time PvP tower defense-game, Forts has other characteristics of more traditional RTS’. There will be special commander units that will all have different, game changing stats and abilities to help shift the battle in your favor, or tip the scales for your enemy. The game will have not only multiplayer, but a 28 mission single-player campaign to help hone your tactics as well as a challenging skirmish mode. Forts will also include a level editor and the ability to playback and save the replay of full matches. Forts is even being optimized, from the beginning, to include mods. One of the key components of the multiplayer is that you can play with up to eight friends. The team match-ups can be as even or as skewed as you like. For example, you could roll a straightforward 4v4, or if some players are feeling a little cocky they could choose to play a more lopsided 6v2 and so on. The multiplayer also supports bots for you and friends to pair with your team or pit them against you. Forts is the type of RTS that allows for tons of strategy and drawn out matches, but can also produce some swift victories to the cunning player. I’m still reeling from the defeat Mike served up to me in about 2 minutes in our second match at PAX East. If you’re a fan of RTS games and are looking for a fresh take on the genre, Forts has the courage to satisfy that need. Nick was kind enough to give us Steam preview keys so we could continue to play Forts leading up to the launch and cover the game in more depth. Needless to say, we’ve been having a blast destroying each other and can’t wait for the official release. The game will be released on Steam April 19 for PC. It’s unclear at this point if there will be a Mac port, hopefully we will see one. To stay up to date with all things Forts, you can follow EarthWork Games on Twitter here, as well as look for the game when it becomes available on Steam here.